Stage Buzz: It’s the end of the world as we know It…. Since the Mayan calendar says the world will end at the stroke of midnight on Friday, the folks at Shock Top want “the believers” to go out with a bang with their own “Earth’s Last Stand” party (Friday@House Of Blues), featuring the X-rated, parody-metal band, Steel Panther. 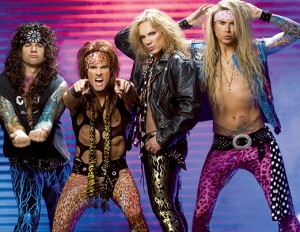 Sometimes Steel Panther blurs the line between real and Memorex (do they actually want to be Motley Crue and Poison? ), but you couldn’t find a better party band to spend your last few hours on Earth with. « Christmas albums: The good, bad, and bah humbug!